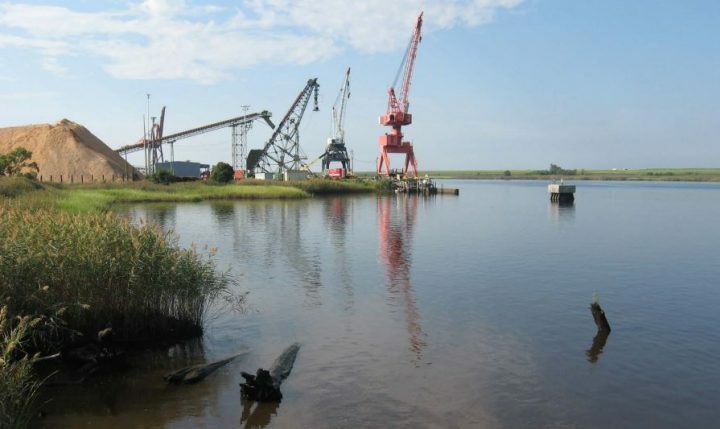 Update Thursday: The Coastal Resources Commission on Wednesday granted the State Ports Authority’s requested variance, which will allow the Wilmington port to expand its turning basin to accommodate larger ships in exchange for agreed-upon mitigation measures and other conditions. 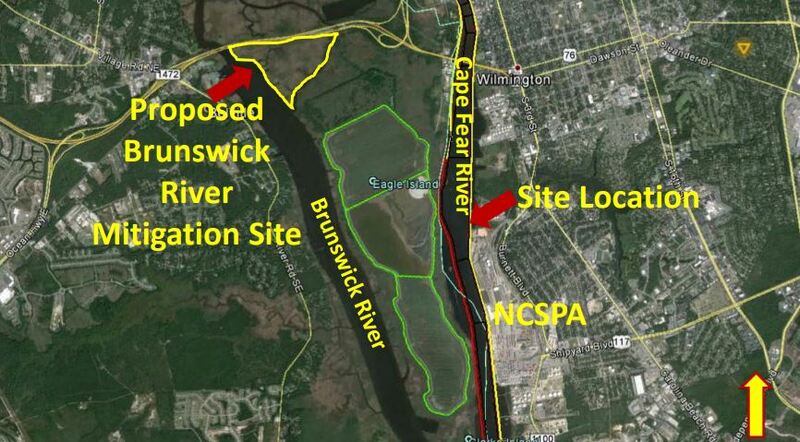 WILMINGTON – The North Carolina State Ports Authority this week will appeal its denial for a state permit to expand the Wilmington port’s turning basin, arguing that the economic benefit to make way for larger ships supersedes environmental concerns. The ports authority will make its case for a variance Wednesday to the Coastal Resource Commission, which establishes coastal management policies and rules. The CRC is scheduled to meet in Manteo Wednesday and Thursday at the Dare County Government Complex. The agenda for the meeting is available. 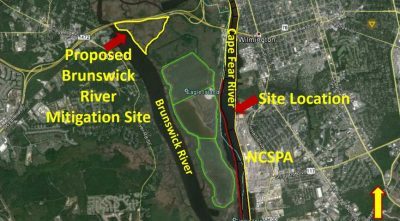 The state Division of Coastal Management last month rejected the ports authority’s application for a Coastal Area Management Act, or CAMA, major permit modification to expand the port’s turning basin, a project that would include dredging 17.76 acres designated primary nursery area, or PNA, in the Cape Fear River and the excavation of a little more than one acre of coastal wetlands. 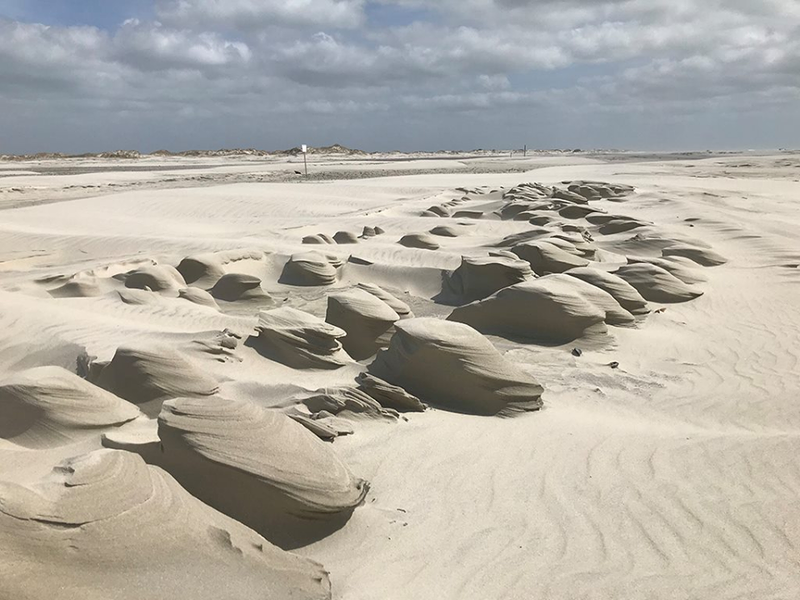 The North Carolina Marine Fisheries Commission designates PNAs to protect habitat, particularly along bottom areas, including sand, mud, sea grasses and oyster rocks. Dredging is restricted in PNAs to protect water quality. 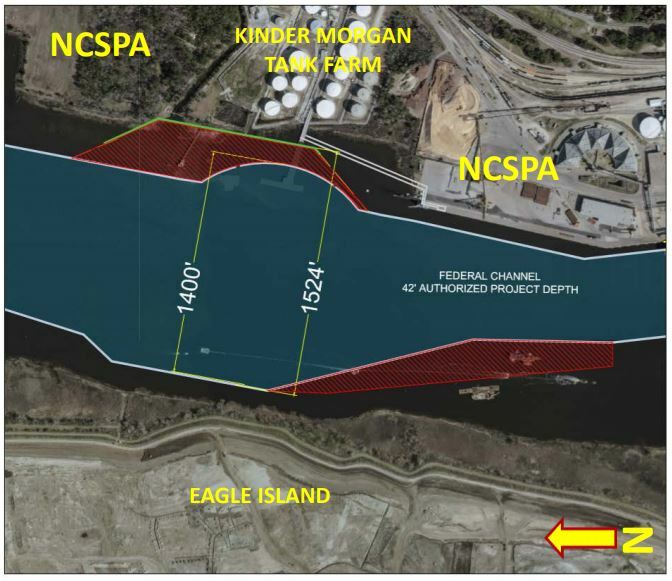 The proposed expansion would include a vertical submerged sheet pile toe wall along the eastern edge of the expanded turning base and dredging to a foot deeper than the current authorized depth of 44 feet. The division denied the authority’s application, saying it must do so for projects found to be inconsistent with state guidelines for areas of environmental concern and would lead to significant damage to fisheries resources. Ports officials say the turning basin needs to be expanded 124 feet to accommodate 14,000 TEU (20-foot equivalent unit) vessels, which can carry 14,000 20- by 8-foot shipping containers. Ships of this size can now be navigated through the Panama Canal, a newly expanded portion of which opened in June 2016. North Carolina ports authority officials say that in order to meet the demands of their customers who want to use these larger ships to transport goods to and from the East Coast, the Wilmington port needs a larger turning basin. Although the state Division of Marine Fisheries, or DMF, did not recommend denying the ports authority’s permit application, it indicated the project would have significant adverse effects on PNA habitat, protected species, fisheries resources and fisheries resources and “would also contribute to significant cumulative impacts to these resources over time,” DCM director Braxton Davis wrote in a March 19 letter issuing the denial. The PNA in the area of the Cape Fear River the ports authority wants to expand is a feeding ground for a high diversity of species including blue crabs, shrimp, southern flounder, spot and croaker, according to Anne Deaton, a DMF habitat assessment coordinator. That area of the river is also habitat for anadromous fish, which are born in and spawn in fresh water, but live most of their lives in salt water, including endangered bottom-feeding Atlantic sturgeon whose diets consist of crustaceans, mollusks and worms. A March 14 memorandum from marine fisheries to coastal management notes that expansion projects at the Wilmington port have altered PNA habitat over the years. Some of the most notable projects, according to the memorandum, have occurred since the ports authority was granted a modification to its CAMA major permit in 1987 authorizing hydraulic dredging of the shipping berths. In 1996, the port deepened the river by 4 feet and, in 2015, dredged in an area of the river that had not been dredged as part of a project that included relocating a docking facility. That project permanently altered more than seven acres and removed 300,000 cubic yards of PNA benthic habitat, according to DMF officials. The Cape Fear River’s bottom habitat and water quality is impacted throughout the year, every year by various projects. Some of those include routine agitation dredging along the ports berthing areas and routine annual federal dredging within the Wilmington Harbor area. Deaton said she cannot say the PNA habitat in that area of the Cape Fear is pristine because of the history of disturbances that have occurred over the years. “But the fact that there are still strong fish numbers in the area tells me they depend on it somewhat,” she said. Wilmington hosts one of two state ports in North Carolina. 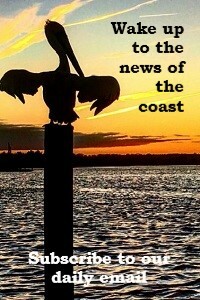 The other is in Morehead City. The port in Wilmington is the only one equipped to accommodate container vessels. Container business makes up nearly half of the more than $38 million in annual revenue generated at the port, according to the ports authority’s variance request. Goods are imported and exported through the port from across the globe, particularly from Asian countries. To keep shipping costs down, companies prefer to use larger ships that can carry the most goods. Now that larger ships can navigate through the Panama Canal, those companies want to use them. Except for the turning basin, the port of Wilmington already has the infrastructure to accommodate 14,000 TEU container ships. “The global economy will continue to exist with or without the (port of Wilmington), but without the POW, North Carolina will suffer greatly,” ports officials state in the variance request. Ports officials say there is no other practical alternative to enlarge the turning basin. In the variance request signed by North Carolina Special Deputy Attorney General Scott Slusser, the ports authority argues that past dredging to maintain the navigation channel and turning basin has reduced the estuarine value and diminished coastal wetlands in the area. In an effort to offset the impacts to the river and wetlands, the ports authority has agreed to a mitigation plan. Excavating phragmites to create tidal pools on 6.75 acres on the ports’ Brunswick River property near the project area. Phragmites is an invasive species that crowd out or shade native vegetation in wetland areas. Officials at the division say there was not enough time to adequately review the proposed project’s impacts and negotiate a mitigation plan because the ports authority did not put a hold on its permit application “due to their internal schedule,” according to the division memorandum. That put a rush on DMF officials, who could not provide “appropriate comment” to the CRC before the 150-day deadline. “We aren’t happy with it, but we’ve agreed to their mitigation,” Deaton said. Division of Water Resources public relations officer Christy Simmoms said Friday in an email that the division was still reviewing the application and a decision had not been made whether to issue a 401 water quality certification for the proposed project. If the commission does not grant the variance, the ports authority may appeal the decision to Superior Court within 30 days of the CRC’s order.